Hairy leaf > smooth leaf cotton. Late planted > early planted cotton. Hot and dry > rainy conditions. 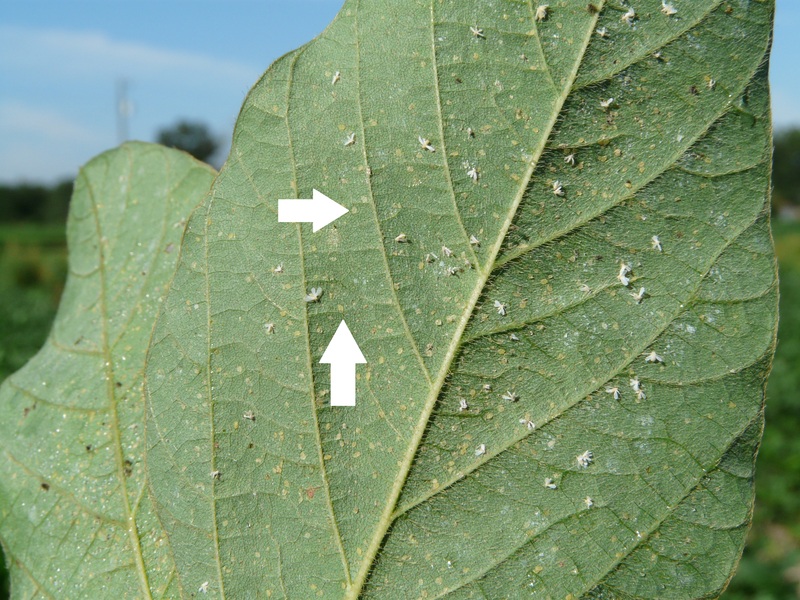 SLWF adults (solid white wings) and immatures will be found on the underside of leaves. SLWF populations are best estimated from the 5th main stem leaf below the terminal. Main stem leaves are attached directly to the main stem by their petioles. The top or first main stem leaf is defined as the uppermost leaf which is 1 inch or larger in diameter. Adults and nymphs should be counted on the 5th main stem leaf below the terminal. Adult whitefly in our UGA On-farm Variety Trial on June 29th. Leaves are considered infested when 3 adults are observed. (This counts adults that fly off when leaf is turned over. Treat when 50 percent of sampled leaves (sample 5th expanded leaf below the terminal) are infested with multiple immatures (≥5 per leaf). Leaves are considered infested if 5 immatures are observes. 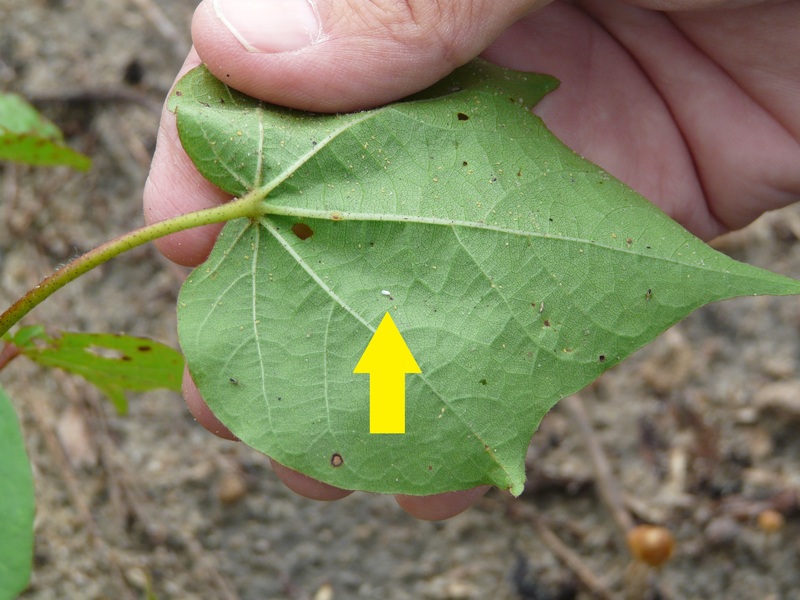 Insect Growth Regulators (Knack and Courier): use of IGRs are the backbone of SLWF management programs in cotton. Effects on SLWF populations are generally slow due to the life stages targeted by IGRs, however these products have long residual activity and perform very well when applied on a timely basis. 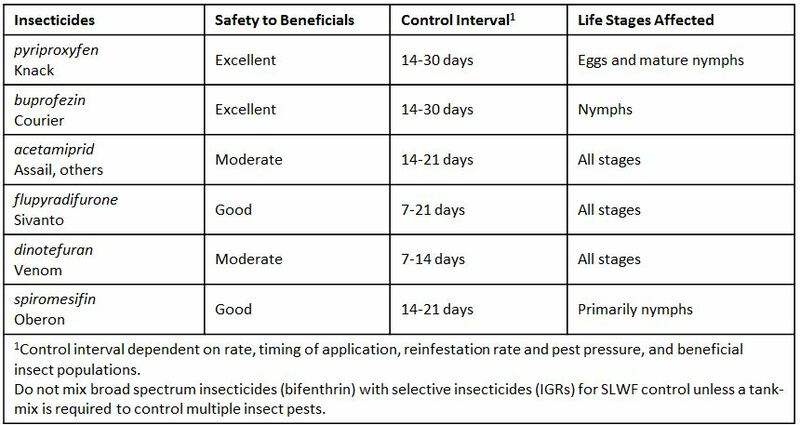 Use of other insecticide options which are active on all life stages have quicker effects on SLWF infestations but lack the residual of IGRs. SLWF is an areawide cross commodity problem. When all parties use sound SLWF management programs all will benefit. Familiarize yourself with the general location of the 5th main stem leaf in each field. Select plants at random at least 25 paces into the field and at least 10 paces apart, being careful to keep your shadow from passing over the plant you plan to sample. Turn the 5th leaf over slowly by its tip or petiole and count the leaf as infested with adults if it has 3 or more adults on it. Include in your counts any adults that fly up from the leaf as you turn it over. Detach the leaf by the petiole from the main stem. If it fails to snap off easily, you have likely sampled a leaf that is too high on the plant. Recheck your leaf position to make sure you are sampling the 5th leaf. Examine the bottom of the leaf for the presence of immature SLWFs. Count the leaf as infested if it has 5 or more immatures on the underside of the leaf. Sample at least 30 plants (leaves) per field. Calculate the percentage of leaves infested with adults and the percentage of leaves infested with immatures. Treatment is recommended when 50 percent of sampled leaves are infested with immature SLWFs.